Why sign up for one race when you can do four? 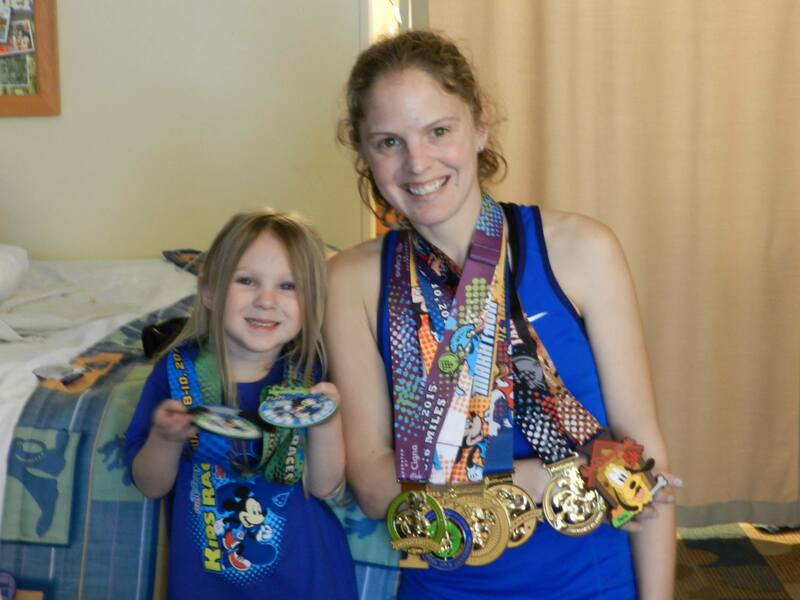 MKE Runner, Angie Smith, recently completed the Dopey Challenge at Walt Disney World’s Marathon Weekend. For those of you that aren’t familiar with the event, runners that sign up for the Dopey Challenge commit to running four races – a 5k, 10k, half marathon and marathon – in four consecutive days. Quite an impressive feat in our minds! Wondering how Angie fared? Read on to learn more and get tips for racing a Disney event! What sparked your interest in signing up for the Dopey Challenge? Had you done any Disney races prior to these races? I am a big medal junkie. 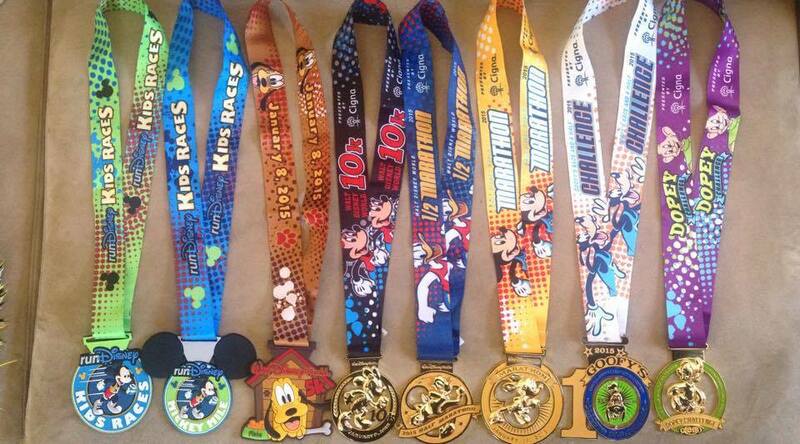 I have a Pinterest board that is devoted to running/medals and I came across the Disney medals on there, not knowing that Disney does races on their grounds. After seeing the medals on Pinterest, I started looking into Disney races on their website, http://www.rundisney.com/. That is where I came across the ultimate prize of six medals for completing four races; a girl couldn’t resist. I had never done a Disney race until I did the Dopey Challenge, and I learned quickly that it is much different from any local race I have ever done. Tell us about your training leading up to Dopey. What were your key workouts/races that helped you know you were ready to tackle the challenge? I made sure to race a half marathon to get a great place time to enter for corral placement. Disney has a ton of corrals and there is a major time difference depending on when you start. So I wanted to make sure I was standing around on my feet as little as possible before the races. I also decided to sign up for Lakefront Marathon and use it as my preparation for the Dopey Challenge. After I ran Lakefront Marathon, I just maintained my long runs with no more than 16 miles for my longest run leading into Dopey. My coach, John Rodahl, and I decided that I had built up enough miles to get me through the challenge. I guess in a way when I ran Lakefront Marathon, and at a much faster pace than I planned for Dopey, I knew I was ready. I know a lot of people who were completing Dopey did what they called mini simulations, like running Thursday-Sunday doing 2/4/11/20. So that they put their bodies through back to backs to make sure they were ready. I already run five days a week so that was enough of a simulation for me. Did you have a goal for the Dopey Challenge? What were your goals going into each individual race? My main goal was to make sure I started and finished ahead of the required time and receive all my medals. Disney requires that runners hold a minimum of 16-minute mile pace from when the balloon ladies/sweepers start who are in the last corral. Depending on your corral placement you have a nice buffer to finish. But knowing my competitive nature, I knew I would need to race something to help offset times I wasn’t used to running for the race distances. 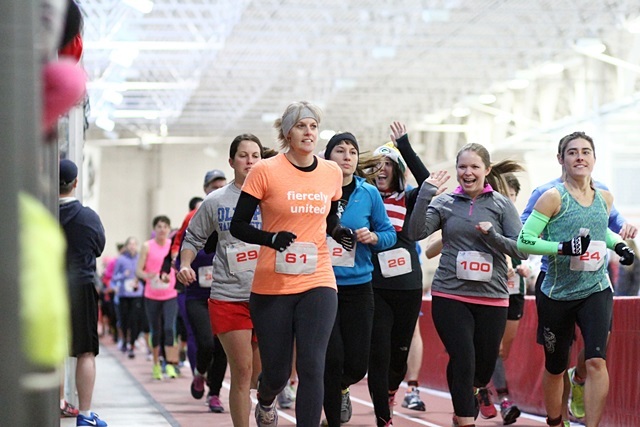 At first I was going to race the 5k, since that is one of my favorite races to run. But I researched more and found out they don’t give age group awards for the 5k. They only chip time the people running the Dopey Challenge and for the rest of the runner/walkers it is just a fun run. So I looked into the previous year’s 10k results and I run times that could put me in the top 3 for my age group and it also had age group awards. I decided I might as well go for another award since I was down there to run anyways. After talking with my coach, we decided to take it easy for the 5k, half and marathon and race the 10k. Knowing you had to complete four races, how did this change your usual approach to racing? Since I was running three of the races for fun, I kept reminding myself to not pick up the pace and just enjoy what was going on around me. It helped that there was plenty to distract me whether it was the thousands of runners around me, the Disney characters available for pictures throughout the course, or even getting to enjoy traveling through the parks with much less of a crowd than when they are open during the day. Can you tell us a bit about each of the races? Let’s start from the first aspect of the race weekend, which was the expo, I haven’t been to many expos but I can only imagine this is the largest expo around. There were numerous floors and buildings. And anything running related you could want to buy was available in every option and color. Runners picked up bibs on one floor and then received shirts on the other. Make sure to print out and sign your waivers ahead of time before the expo because it saves time. I had to have three waivers: One for my Dopey Challenge and then I signed my daughter up for the Kids run and the Mickey mile, so I had three. For the Dopey Challenge there are two bibs: One for the 5k/10k and one for the half/full. For shirts, I got five dri-wick long sleeves and one cotton t-shirt for the 5k. The kids get mini bibs, a chip time and shirts. Runners are also required to take a picture holding their bib right under their chin so that when crossing the finish line on marathon morning they can check to make sure the right person is completing the challenge. For the Kids Runs, the 100 yard dash starts at 11am and Mickey Mile at 12:15pm, so we decided to do them the first day to get them done. They start the kids’ races in waves. My daughter, Makayla, was the first race of the day and we were in the front so we went off with the first wave. They have the kids run at the ESPN Wide World of Sports track. 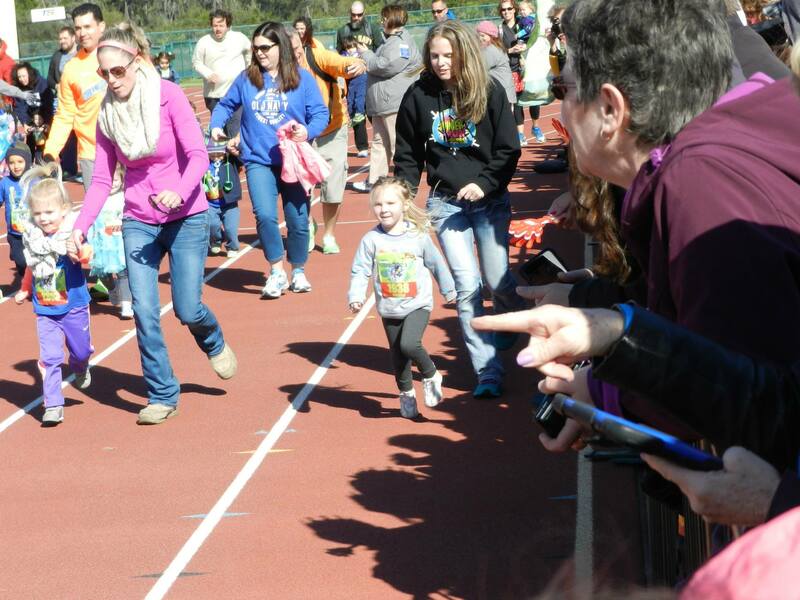 Parents are allowed to run with their kids and we lined up for the 100 yard dash with about 14 other kids right as they made the announcements that Mickey Mouse was at the finish line. That got a smile on all of the kids’ faces. The race was exactly as you would expect – some kids ran and some kids had no clue what was going on. After the kids crossed the finish line – with a high-five from Mickey – they received their medals and were treated to all of the same snacks I received at the adult races. The mile was very similar, except it starts outside of the expo and then goes around the ESPN grounds, including on the track of their baseball diamond, before finishing the last 300 yards where Mickey waited again to high-five the kids. If you have a kid who likes to run I highly recommend it. My daughter was all smiles and super proud of her race shirts, bibs and two medals, which are rubbery so I don’t have to worry about her hurting herself on them. As an adult, I had a blast being part of it and watching all of the kids. They also give out finisher certificates for the Mickey Mile, which she finished in 12:48 at three weeks shy of 4 years old; I had a pretty proud runner mama moment. The 5k start time was 6:15am. It was 43 degrees but felt like 35 with the wind chill and 25 miles-per-hour winds. I was not prepared, since the weather originally said 50-70 degrees. Disney has participants stand in their corrals at least 45 minutes before the run, plus the time it takes to wait for the bus to the race, then the half mile walk from the bus to bag check. I was outside for about two hours and needless to say I was cold. The 5k course starts outside of Epcot and then wraps around the outside before it goes into Epcot and you get to run around the world. The course finishes just outside of Epcot. Disney cast members are located throughout the course and are very enthusiastic and such great cheerleaders I couldn’t help but smile as I passed them. There were also photographers every time I turned a corner, so if you like running pictures there are tons of opportunities. The medal I received for finishing the 5k is rubber as to make it more family friendly, similar to the kid medals. I finished in 27:39, my slowest 5k, but I took in the sites and enjoyed it. The 10k start time was 5:30am. This was my actual racing event so I remember less of it since I was so focused on the running aspect. This race also started outside of Epcot. But this was my first experience with running on Disney’s freeway system, which I hate to say was boring and the least liked part of all the races. A lot of their freeways are banked and are really not that great to run on so I wound up in the grass for some of the race. I do remember within the first mile coming up to a freeway overpass where the infamous Elsa and Ana of Frozen were waving at us from above. I saw specks of something falling down and assumed it was Disney making it seem like snow, but as I passed under them I was surprised to learn it was actual snow. Only Disney knows how to do it best. Next was the deck of cards from Alice in Wonderland before we turned to run over a freeway on ramp and then back down to the same back entrance of expo as the 5k. This time I spent more time in Epcot to help cover the distance. And the Disney cast members were again enthusiastic and great cheerleaders. I know there were more characters throughout but I didn’t notice due to racing. We made a decent amount of turns throughout Epcot and runners need to watch their footing. I finished at 46:17 and 10th in my age group 30-34 of 973. Not quite what I had hoped but still pretty well. The half marathon start time was 5:30am and this was the most magical race for me. It was the first time we would run somewhere other than Epcot. The race starts outside of Epcot and takes the freeway to get to the Magic Kingdom. Runners get to Main Street Magic Kingdom at about 5½ miles into the race and the first thing I saw was the Christmas tree still decorated and lit up. Then we took a right turn and were blindsided by Main Street decorated in all of its Christmas glory, all lit up, including all of the shops and Cinderella’s Castle illuminated up as if Elsa had frozen it over. I almost teared up it was so breathtaking. They also let family members come and stand along Main Street to cheer and it was so loud and welcoming even though I knew no one in the crowd. And to top it off, Disney played When You Wish Upon A Star. All of this hit me at once and I knew this would probably be the most magical running moment I would ever experience and I tried to take in every second. Next we headed into Tomorrowland where there were some rides going and that added to the magic of it all. Then we circled around the castle, where more rides were spinning and playing music – it was amazing. Then everyone’s favorites, Christophe, Elsa and Ana were standing atop a balcony on Cinderella’s Castle waving at us as we ran through the tunnel and through more of the Magic Kingdom. There were many more characters and picture-taking opportunities, but I had decided I wouldn’t take pictures or stop until the marathon. I finished in 2:00.08 with a smile on my face. The marathon start time was 5:30am. For me, this race was the hardest since I was ready to be done. I was absolutely exhausted and wasn’t running for a certain time, which is foreign to me. The race again started outside of Epcot. We ran more freeways to start, and our first character was Jack Sparrow. Then we hit the Magic Kingdom welcome sign and characters including, Wreck it Ralph & Vennelope, Jack Skeleton, Mickey, Robin Hood and Rapunzel. We stopped at EVERY character. For the marathon, you run Magic Kingdom, the Nascar Experience track, Animal Kingdom, ESPN Wide World of Sports Hollywood Studios, then Epcot to finish it out. The group I was running with decided they wanted to ride Animal Kingdom’s Expedition Everest roller coaster, which was about 13 miles into the marathon. However, the roller coaster didn’t open til 9am, so we had a lot of time to kill. I originally had planned on dropping my group and continuing on, but I had so much fun running with these guys and taking pictures that I figured I may as well join them for the roller coaster. I mean who does that – ride a roller coaster in the middle of a marathon? After the roller coaster, we got down to business and negative split our second half of the marathon by an hour, while still taking pictures. There is not much to see after Animal Kingdom til we got to Hollywood Studios. There were a few character spots but for the most part what kept us sane on the miles of freeway were each other and I feel lucky for that. Since we took so long to finish our marathon, the parks were open and it was awesome to have people who were visiting the parks cheer us along. I know a few people who hit a couple other rides but we stuck to one. Although it was my longest marathon by far, the memories and experiences I had outweighed any finishing time. I finished at 6:01.29. How did you recover between races? I wish I could say I recovered, but in a way I think it also helped me to walk around at the parks. I think the walking helped keep my legs from cramping up, but my feet were very sore by the night before the marathon. I did not get much sleep either since we were trying to spend as much time at the parks, so I went to bed anywhere between 10-11pm and got up at 3am. What types of thoughts went through your head as you approached the finish line of the final race? First off the mile 25 marker was the most amazing sight I had ever seen. I never thought it would be so hard to run a marathon at that pace so I was in for a rude awaking. All I could think was oh my god I am almost done, I can stop running. And the thought of a complete week off after helped. We were also flying home the day of the marathon so the thought of my own bed that night was amazing! And also being done with the 2:45-3am wake up calls was a victory, too. It also rained a couple of times so the thought of a shower and dry clothes was good, too. What tips would you give to people considering doing the Dopey Challenge? I would advise doing a full marathon in your training. I know of a lot of people who did it as their first full and wished they had done it differently. Practice getting up early and running on little sleep, and being on your feet a lot – I think being on my feet was the hardest part for me. Also, have fun, take pictures, goof off, even dress up like a ton of people do. I made Disney-themed hair bows for each race and then wore race tops to go along with my theme. 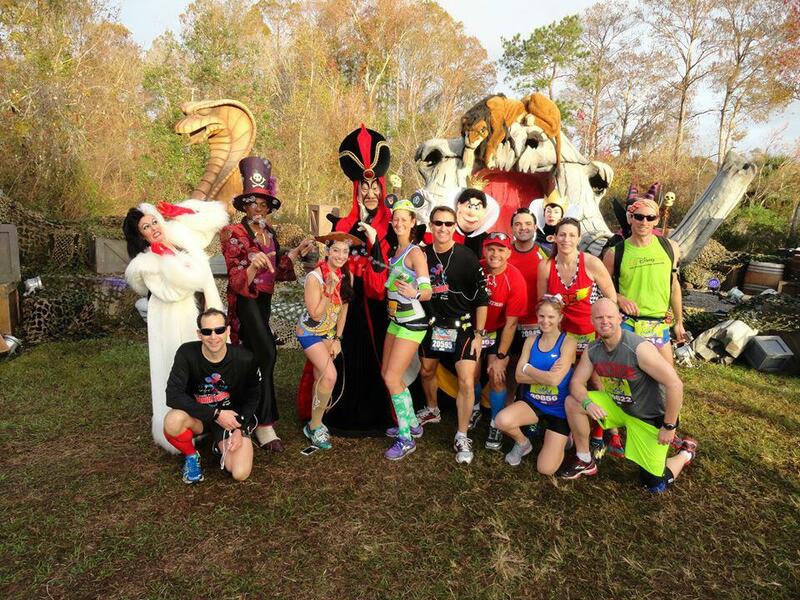 Disney races sell out fast – what was your strategy for securing your spot? Let me start with saying that you cannot sign up for any Disney races the day of or even week of – they all sell out way in advance. I was more nervous signing up for these races then I was lining up for any starting line that weekend. Disney opens it race registration at noon their time so at 11am our time I was on the computer clicking on the link. The Dopey Challenge, which has about 7,500 spots, sold out in less than three hours, so there was no thinking about it. You need to decide before registration if you are in or not. The kids’ races also sell out but you have much more time on those if you want to try a local race to make sure it is worth the money. But keep an eye on the registration numbers because they do sell out. For Disney Marathon Weekend 2016, they increased the price by $20 to $550.00 for the Dopey Challenge. Disney Marathon Weekend goes on sale Tuesday, April 28th, 2015, and will take place January 6-10, 2016. The kids’ races are $15-$20, and the Mickey Mile is $30-$35. When entering your time for corral placement, go with whatever time has you at a faster pace. I ran a 3:52 marathon and a 1:45 half, so I used my half marathon results. This is a huge time and money commitment. It does NOT include park tickets, and you DO NOT get discounted park tickets or hotels rooms. It gets you the four races, and six shirts and two bibs. If you want to save on active.com fees, make sure you sign up for all races at once. Can you tell us about the trip planning process? How did you decide when to arrive and leave? Where to stay and eat? This was the hardest part for me since I had not been to Disney since I was 15, and my parents were the planners then. So I learned a lot while planning this trip. I used a travel agent for my hotel since they get group discounted rates for the marathon weekend. We stayed at Pop Century, which was very close to the expo. We flew down Tuesday, the day before the expo. Disney will NOT let anyone but you pick up your packet, no exceptions, so don’t bother. We left after the marathon since I needed to work Monday and pick our dogs up from their kennel. We left at 5:45pm so we didn’t have to rush after I got done running and I had time to eat, shower, and walk around to avoid cramping. Choosing where to eat was tough since dinner reservations open up 120 days before your reservation and they fill up fast for some restaurants. So I tried to choose with places that looked like they had a good selection so I could make sure not to eat anything crazy. We ate at Yak & Yeti, Planet Hollywood, Sci-Fi Diner and Chef Mickey. Give us a glimpse into your suitcase for the trip – how many running outfits and shoes did you pack? Did you bring any other running gear? I packed my most important running stuff in my carry on to be on the safe side. I brought only what I thought I needed, which left me under prepared due to the cold front. I had five pairs of shorts, sports bras and tanks, one long sleeve, and one throwaway shirt. I had my main pair of running shoes in my carry on. Then I had my race flats and two older pair of running shoes in my regular suitcase as backups. I would advise bringing all types of clothes – I never knew Florida got that cold. I am a very minimal runner, so as long as I have my watch, I’m good to go. I took two gels for the marathon and one for the half. Other than that, Disney has a ton of aid stations so I just hydrated at every one they offered, which I would say were about every 1.5 miles in the longer races. How did you make time to do all the other fun stuff Disney has to offer? I pretty much finished each race and caught the bus back to our hotel so I could shower, and then we got ready and would head out to the parks between 10-11am. We usually got back to our room around 8-10pm. Even though I was tired, seeing the smile and excitement on my daughter’s face kept me moving. We did Disney three days and then my husband I went to Universal for one day while the in-laws took her for more character autographs and pictures at Disney. What was most memorable about the Disney race experience? I joined a Dopey Facebook group back in April 2014 and chatted with all of these people for nine months. So it was amazing to meet so many of them in person. But I think the moment in the half when I saw the castle and Main Street was up there. And of course crossing that last finish line and being handed my marathon medal, Goofy Medal, and Dopey medal was icing on the cake. I think the whole experience was totally worth the money. But as for whether I would do it ever again, probably not. But that is only because I have a huge bucket lists of races and medals I want to earn. But I do want to do other Disney races, which they host throughout the year at both theme parks in the USA. Plus, there is always the Coast to Coast medal I have my eye on, which you earn after completing at least a half at both Disney World and Disneyland in the same calendar year. I would also advise if you are going with kids to go ahead of time to do the park and then just spend time around the hotel during the race part of the week. That way you can get good sleep and recover. Thank you for the wonderful race recap, Angie! 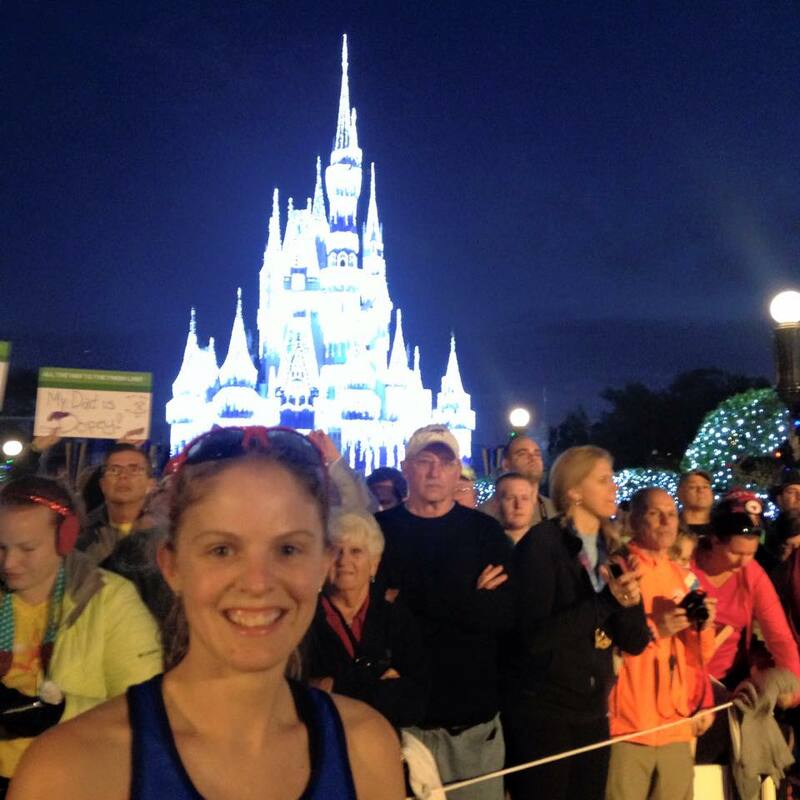 If you would like to learn more about running a Disney race, Angie welcomes questions via Facebook or at the Tuesday evening Badgerland Striders speed workout that she leads at the Pettit National Ice Center. 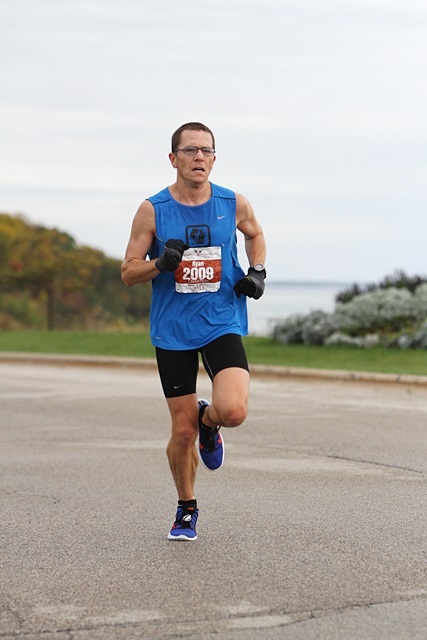 If you’re a runner in MKE, we’d love to hear about your recent races. 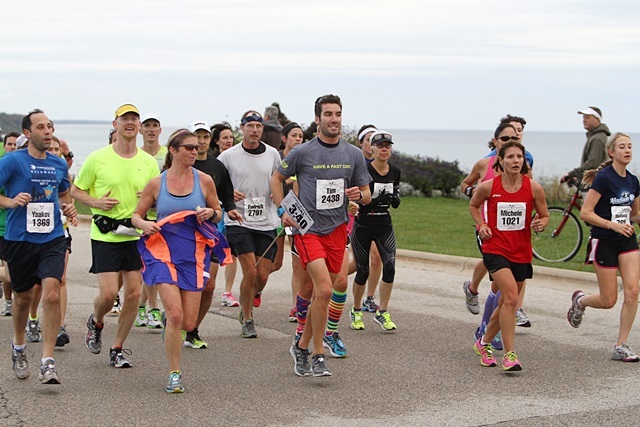 Send us an email at keeprunningmke@gmail.com if you’d like to participate in a race recap post. One of the best aspects of racing is getting to see your friends. 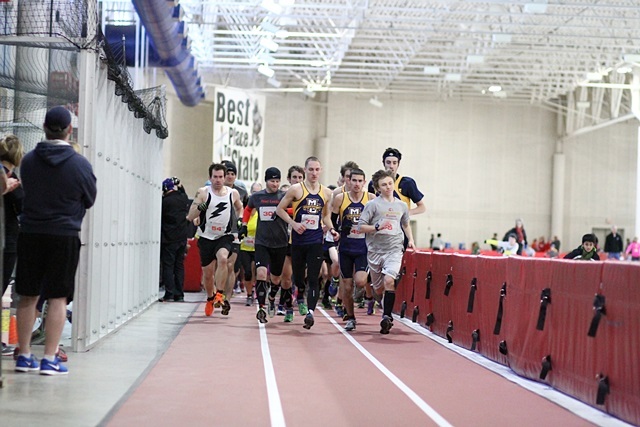 And one of the very best events to do this at is the Indoor Marathon Relay. 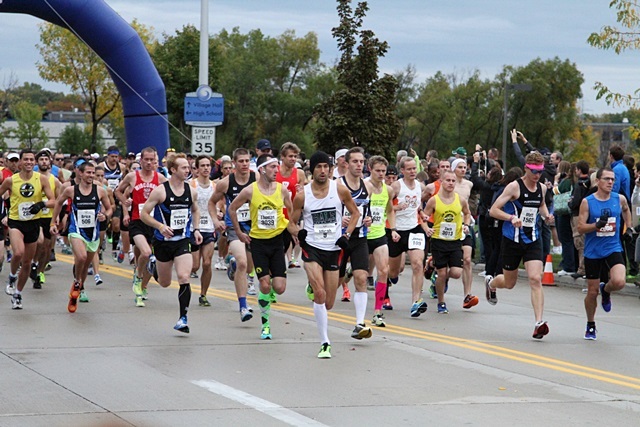 This high-energy race is a favorite among Milwaukee runners for good reason. It’s a well-organized event that allows runners to work together in teams of 2-4 to complete the marathon distance however they choose. 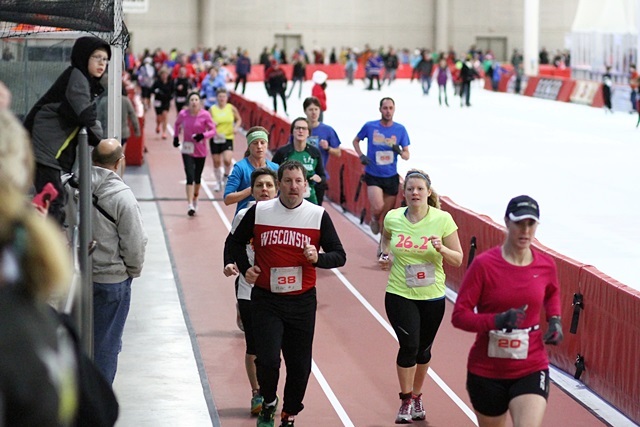 It also doesn’t hurt that the event takes place on the Pettit National Ice Center’s indoor track – after all, who doesn’t love not worrying about the weather for once, plus you can wear shorts in January! The event once again sold out well before race day. As always, there were fast finishing times for the teams that won overall prizes for each of the three divisions: all male, all female and mixed. The winning all-male team, Berkeley Running Company, finished in 2:28:20. The winning all-female team, Chicks that ROCK, finished in 2:45:23. The winning mixed team, Marquette MURCenaries, finished in 2:31:36. It should be noted that the winning mixed team finished an impressive second overall – a first in Indoor Marathon Relay history! For those of you who didn’t get in on the action this year, we highly recommend adding this race to your schedule in 2015. And be sure to register early – this one’s sure to sell out early again! 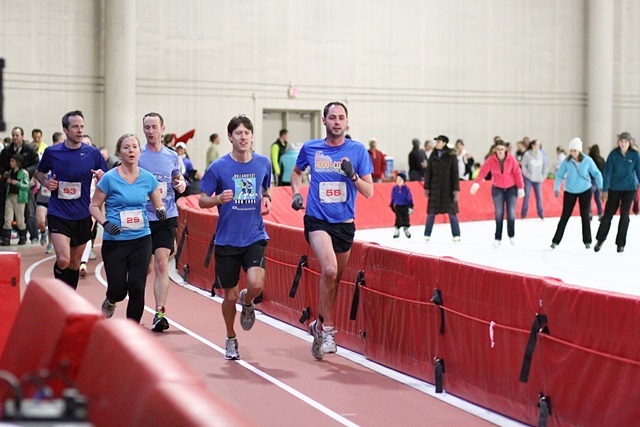 Tell us: Did you race any of the Indoor Marathon events over the weekend? Despite a changeable forecast in the days leading up to the 33rd annual Milwaukee Lakefront Marathon, it turned out to be a beautiful day to run a marathon. More than 2,100 runners finished this year’s race. Winning the men’s race was Ryan Meissen of Mukwanago with a time of 2:28:23. Finishing 2nd and 3rd were Zachary Meineke of Wauwatosa and Josh Kaplan of Portland, Oregon. 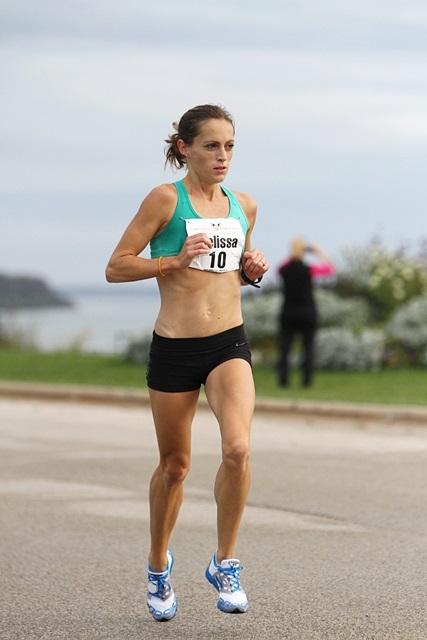 The winner of the women’s race was Melissa Burkart of Hudson, Wisconsin with a time of 2:45:31. Finishing 2nd and 3rd were Amanda Daws and Ruth Swedler, both from Milwaukee. The top male and female Masters winners were Eric Pilling and Kit McCaffrey. The top male and female Grandmasters winners were Tim Stieber and Georgine Kudrna. Michelle Zerzanek – Speeding through the miles to win an Age Group award. We hope everyone had a great race. From what we’ve heard, it sounds like there were a lot of PRs and plenty of fantastic memories that came out of this race. Congrats to everyone who participated and thanks to the Badgerland Striders for once again organizing a fantastic event! It’s settled: Race for the Bacon is well on its way to becoming an MKE race you just can’t miss. 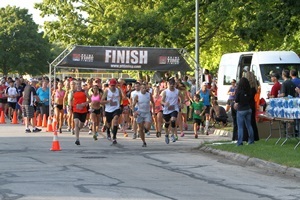 This year’s race was held at Sheridan Park (last year’s location was State Fair Park) and included a flat course that ran through the park and along Lake Drive. There was plenty of Patrick Cudahy bacon to go around. 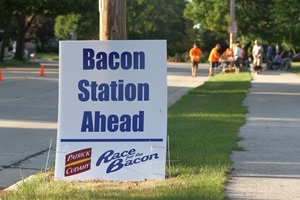 A bacon aid station was located halfway through the course and runners received a box of bacon upon crossing the finish line. 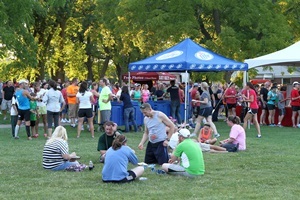 After catching their breath, runners pigged out at the Bacon Bash, which featured bacon-themed treats such as bacon sandwiches, bacon pasta salad, BLT dip and even bacon brownies! Gino’s Gypsies rocked out while runners socialized and munched on bacon treats. Next up, the awards ceremony! This year’s overall male winner was Matt Thull (also last year’s 10k winner). Before the race, he told us he was doing the race as a fun workout, but even without going all out, he easily won the race. One spectator was even overheard exclaiming “He beat everyone – even the wheelchairs that started before the runners!” Our question is, are there any MKE runners that can beat him? We’re not so sure . . .
Matt Hibbard (New Berlin) and Andrew Hirsch (Brookfield) rounded out the male top three overall. Allison Arndt (Franklin) edged out last year’s female winner, Jennifer Chaudoir (Green Bay), to take home the female overall title. Danielle Macareno (Kenosha) took 3rd. Mary Flaws and Tracey Gessner – these ladies are unstoppable. Both raced all three half marathon heats at last weekend’s Heatbreaker and still managed to run away with Age Group wins last night. 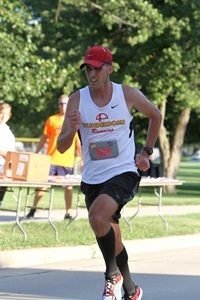 Jeff Dallmann, looking strong and on his way to an Age Group win. Anne Munkwitz, Sara Kohlbeck, Renee Hill, Jennifer Hubbartt, Carrie Hayne and Sara Johansen cruising around the mile 2.x turnaround area. Trae and Jessica Hoepner from Performance Running Outfitters at the finish line and handing out bottles of water to tired, but happy, runners. The Boss Hog who was overseeing everything and made sure the event was a great success. We had a blast at this event and are already looking forward to next year’s race. Make sure you get this one on your 2014 race schedule – it’s not to be missed!